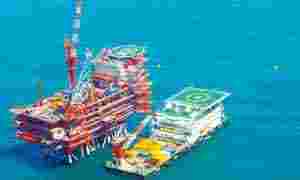 Legal tangle: A Reliance oil rig in the Krishna-Godavari basin. New Delhi: The government justified its petition against a lower court order asking Reliance Industries Ltd (RIL) to honour a gas supply agreement, saying it goes against the production-sharing contract and public policy. “The government is an aggrieved party," additional solicitor general Mohan Parasaran told a panel of Supreme Court judges headed by Chief Justice K.G. Balakrishnan in the courtroom in New Delhi on Tuesday. “Without any prejudice, our right should be protected." The government said in its petition the production-sharing contract with RIL must prevail over any private sale arrangements. The Bombay high court ordered RIL, controlled by Mukesh Ambani, to honour an agreement to supply gas at a discount to Reliance Natural Resources Ltd (RNRL), owned by estranged brother Anil Ambani. The agreement was reached in 2005 when the Ambani family business was divided between the brothers. The gas was meant for a power plant planned in north India. The government set a higher price for the gas in 2007, after which RIL said it can’t sell the fuel at the lower rate. The government also chose customers for the gas and the quantity of the cleaner-burning fuel to be supplied to them. Fuel-starved power and fertilizer producers were among the priority customers for the gas. RNRL lawyer Ram Jethmalani objected to the government’s petition, saying it wasn’t a party to the lawsuit in the Bombay high court. “If they assist the court as an intervener, we have no objection," Jethmalani said. “If they produce new documents, we must have a right to cross-examine."